Want to check all the changes and keep abreast of news on your site? Just switch on Notifications in Live Chat Plugin! 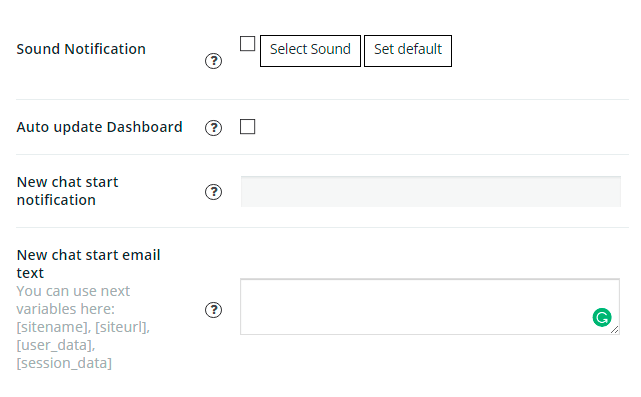 First of all, get the “Live Chat” directory on the admin panel of your WordPress site. Then check the insert “Settings” and open the Notifications tab. Sound Notification – Sound that will be played for your users and support agents once new message is arrived. There also two options avalaibale for this function: Set default sound or Select the want, you want. Auto update Dashboard – Periodically auto update Agents Dashboard – to check new chat sessions in auto mode. Once new message will arrive – sound notification will be triggered. New chat start notification – Enter the email addresses that should receive notifications (separate by comma) about new chat start. Leave it blank – and you will not get any notifications. New chat start email text – Message that you will receive about new chat start on your site. If you need an additional info or want to check more questions – look through our Live Chat Documentation Page.